So it’s been a long time since I last posted. A very long time. I don’t even dare to look back and see what the last post was, but I’m guessing it’s probably about 18 months or so. A lot has happened to me over the last 18 months, and I’d like to say it’s all been good, but the truth is, life has not been kind, to myself or my family. There have been losses – oh so many losses, and sickness and just much, much heartache. I’ll admit, that most of the heartache has been my own, which I will get into later, but not this post. This post is about good things. I may have been having a pretty crap time of it, but I’m happy to say that I’ve still been quilting (and crocheting) up a storm. And then, I joined the Modern Quilt Guild. That was a shining moment for me, the day that I got my MQG pin. It sits proudly on my desk, next to my computer so I can see it all the time. It cheers me up. To know that I belong to a group of people around the world who all love to quilt. And create. So I happily signed up for my first Fabric Challenge back in February – creating a quilted product out of some Michael Miller prints. It was exciting, being forced to extend my creativity and make a quilt out of fabrics not of my choosing. Exciting, but daunting. When I received them, my first thought was, I would never in a million years pick those fabrics out in the store – just what am I going to do with them. But that thought was short lived, the fabrics just lent themselves to an idea I’d had floating around in my head for some time – creating a quilt that showed my move from the city, to the country – my home, a place I could never imagine not living in anymore. So I sat down, and started drawing up my design, and ordered more fabrics to go along with what I had already recieved. 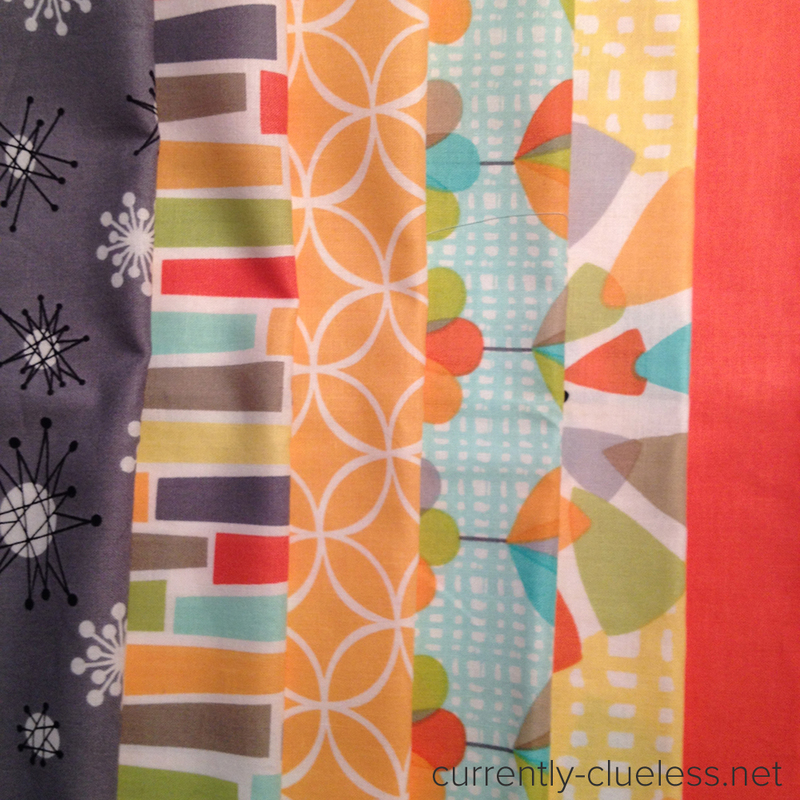 And then I started sewing – curves, lots of curves. Something I don’t really ever work with. But it was fun. And then life got in the way again and things made me sad. I put the quilt away and forgot all about it. I’d lost the will to do the quilt and I didn’t love anything let alone my beautiful city I call home. 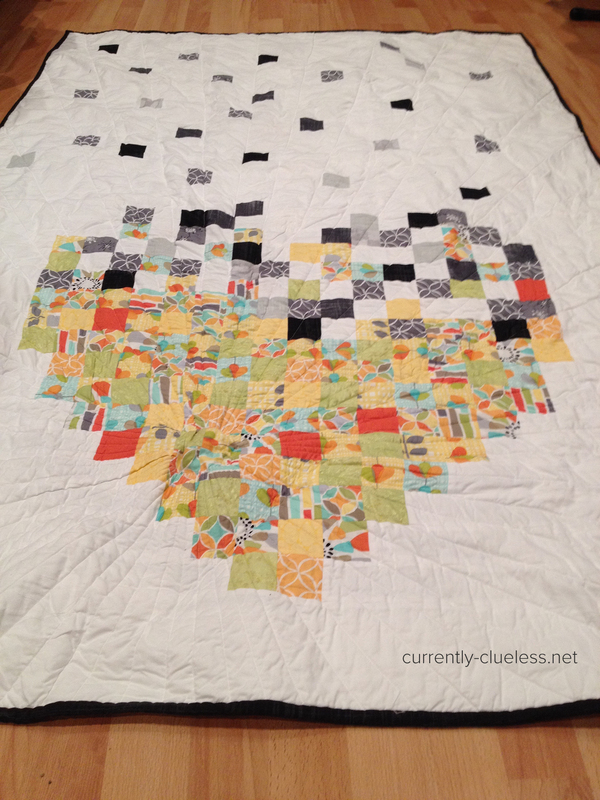 But eventually, the fog lifted and over the last week and a bit I pulled it out again and just like that, I had the perfect idea on just what I wanted to do with my quilt. I wanted to make something that was beautiful that I could hang up on my wall and remind myself that while there are always going to be black times, there will always come a time when the happiness is going to push that blackness in my heart away. So again, I sat down, and quickly drew up my design (and I have to give a huge shout-out here to Caro Sheridan and her fantastic Craftsy course – Pictures to Pixel Quilts, for teaching me everything I ever needed to know about creating my own pixel quilt and working out how many squares I’d actually need. THANK YOU, your class was uber awesome) and got cutting and quilting. 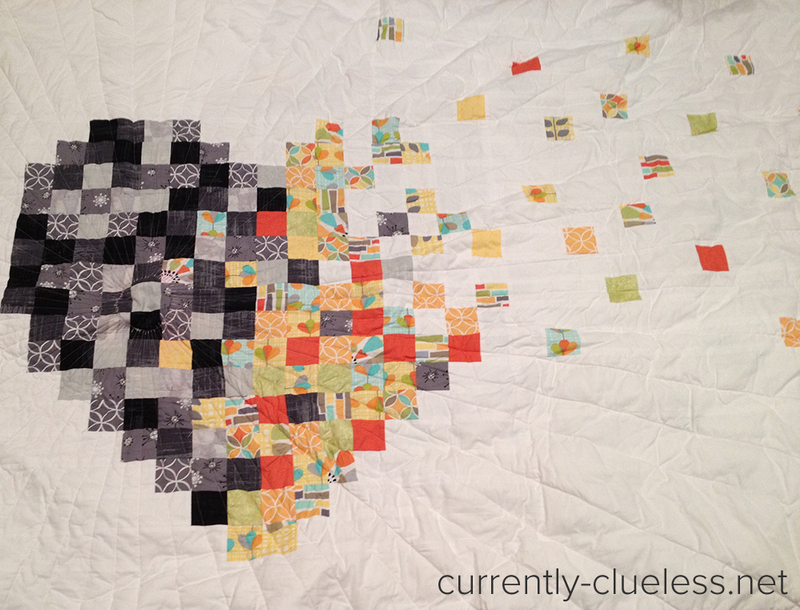 So I ended up with a quilt that comes directly from my heart and I’ve called it “Time heals all heartache” – because I truly hope that is the truth. 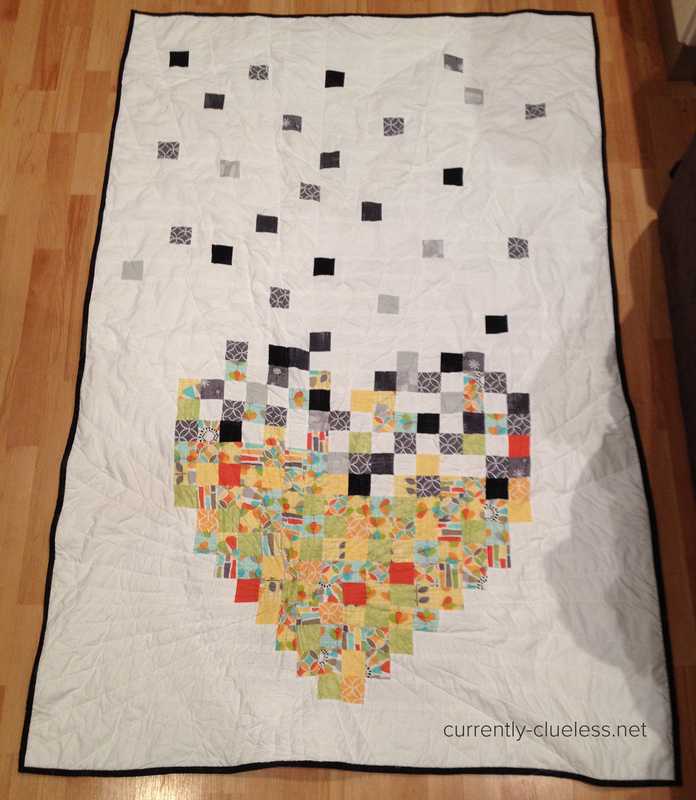 The quilt measure 50″ by 73″ and is a two sided 2″ square pixel quilt. On the one side is heartache overwhelming everything. The black (sadness) in the heart is taking over the colour (happiness) and pushing it out. 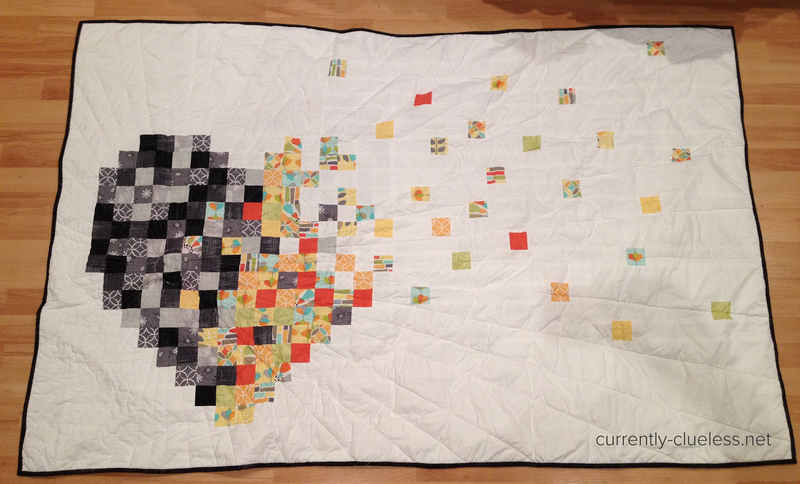 But when the quilt is flipped over, the happiness is fighting back and pushing that blackness out and up and away. The quilting was done by me on my Janome 2160DC and is quilted in a clock face. It is 60 lines – each representing a minute – to reflect that time heals. 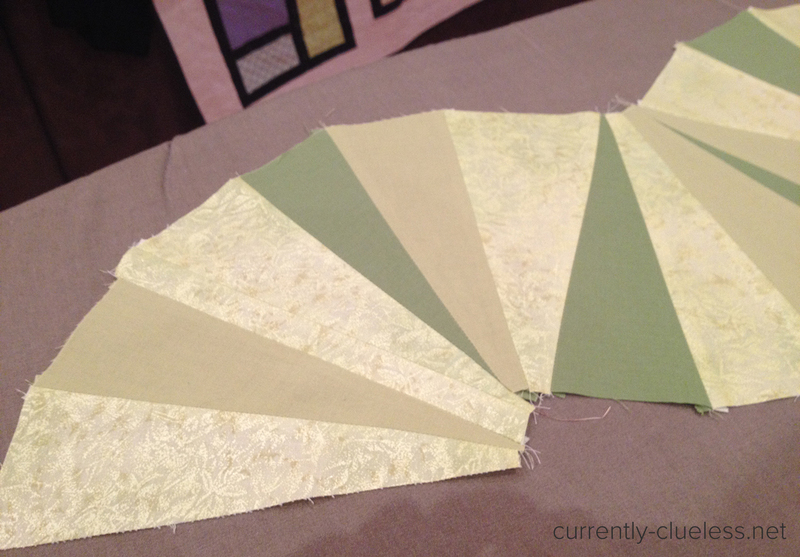 I’ve made this quilt mostly to be a wall hanging – I don’t intend to use it as a lap quilt, but as an art piece. Oh. And in the end? I’m so glad that these fabrics were given to me to participate with. Because while I might never have actually chosen them, they worked so well with my idea and I actually really love them now. (Secretly, very glad that I ordered extra and have leftovers that I can make something else with). I really hope you all love this quilt as much as I do, and I am really looking forward to getting back into my quilting with a vengeance and back into the blogging again. Now that I’m in here and typing away, I realise just how much I’ve missed it. I also intend on taking some better pictures tomorrow or over the weekend, but it’s late and dark and cold and raining outside, so those photos just weren’t happening tonight. I’m glad you are finding some therapy in quilting – to help you deal with the sadness in your life. I’m sorry for any loss that you may have experienced.